The Grilled Cheese sandwich is such a comfort food. The oozey, gooey cheese… the perfectly toasted gluten-free bread that is crunchy & buttery on the outside, and soft & warm on the inside. Perfection. But if just the “basic” grilled cheese sandwich has so much perfection going on – what could a little creativity fueled by a bunch of fanatic grilled cheese lovin’ foodies create? Udi’s Gluten-Free Bread, in partnership with Horizon Organic Cheese, has taken on this feat and is sponsoring a challenge among a group of top food bloggers and chefs. The task? To create an original, unique & delicious Grilled Cheese Sandwich. First off… I was thrilled that I was asked to compete in this challenge… so thank you Udi’s and Horizon Organics. Secondly, I’ve come up with three Grilled Cheese creations that will each blow your gluten-free griddles off. Along with the first gluten-free grilled creation listed below, my Prosciutto & Blackberry Grilled Cheese Sandwich with a Balsamic Reduction, I have also created a Cherrywood Smoke Bacon & Date Stuffed Grilled Cheese Sandwich, which is reminiscent of my favorite appetizer of all time (Blue Cheese Stuffed Dates Wrapped in Cherrywood Smoked Bacon) and also a fantastic breakfast grilled cheese creation – a Honey-Apple & Strawberry Grilled Cheesy Breakfast Sandwich. Thanks to Udi’s Gluten-Free Bread and Horizon Organic Cheese for getting my grill-ative forces moving! Enjoy! Who said Grilled Cheese Sandwiches had to boring? This sandwich is salty, sweet and tangy…. All grilled into one. I really stuffed my sandwich with blackberries (since I love them so much) but use fewer or even substitute blackberry preserves. The Balsamic Reduction creates a unique dipping experience! Spread 1 tablespoon of butter on one side of each slice of bread. Place one of the slices of bread butter side down in a skillet over medium heat. Place 1-2 slices of cheese on the bread. Next top with ½ the prosciutto, the blackberries, the remaining prosciutto, and 1-2 slice of cheese. Top with the remaining piece of bread, butter side up. Cook for about 6-7 minutes, flipping to ensure each side is golden brown. While the sandwich is grilling, heat the balsamic vinegar in a small saucepan over high heat. The vinegar will boil quickly, so whisk often to prevent scorching. Add in the sugar little-by-little. Cook, and continue whisking, until the vinegar is reduced by about ½ and is syrupy and thick. Drizzle the Balsamic Reduction in a fun pattern on the plate. Place the halved sandwich on top. Dip sandwich into the reduction for a tangy dipping experience! 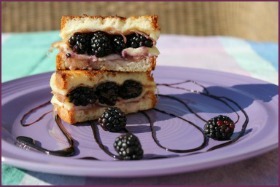 This entry was posted on Monday, April 30th, 2012 at 2:25 pm	and is filed under Recipes. You can follow any responses to this entry through the RSS 2.0 feed. You can leave a response, or trackback from your own site.